Everyone has a Honda Accord story. Maybe it was your mom’s car. Maybe you had one in college, or used to join your friend on his delivery food runs. Maybe yours had Type-R stickers you’d prefer not to talk about today. With 13 million Accords sold since 1976, you may even be driving one right now. And if you’re not, maybe you should be, because 2018 Honda Accord is one fine regular car. It may not stand out in any one spectacular way, but that’s only because it does pretty much everything quite well. It’s as normal as you get, and as good as normal can be in 2018. The Accord is ubiquitous. It needs no introduction. Everyone knows what it is. Four doors (and four doors only now that the coupe is gone), roomy trunk and back seats, good gas mileage, dead reliable. Always the smarter, more driver-focused alternative to the beige-tastic Toyota Camry, the Accord’s even boasted solidly decent driving dynamics for a midsize sedan. It’s a pick that’s just hard to argue with. If someone really wanted an Accord, would you talk them out of it? 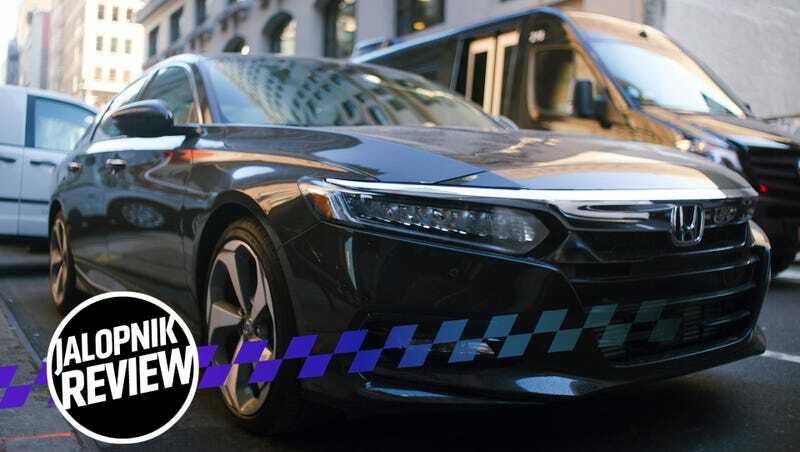 Even while crossovers and SUVs dominate new car sales and sedans fall out of fashion, the Accord’s so critical to Honda’s bottom line that there was no way this car was going to be phoned-in. It’s a bread-and-butter car for this company. It had to be good. It had to be worthy of those reliably strong sales numbers it posts every year. This seems to be the trend among sedans right now: as everyday buyers flock to crossovers, traditional sedans must be the more stylish, driver-focused, captivating alternatives. So believe it or not, the 2018 Accord does mix up the formula a little bit. Everything’s new on the 10th generation Accord. It rides on a new Honda platform also used by the Civic and CR-V. The coupe is dead, and so is the wonderful 3.5-liter V6 engine. The base engine is now a 1.5-liter turbo four-cylinder rated at 192 horsepower, and the top engine on the car you see here—a top-trim Accord Touring—had the surprisingly quick 2.0-liter four, a close cousin to the rocket delivery system in the Civic Type-R. Here, the engine’s rated at 252 HP and 273 lb-ft of torque. You can still get a manual transmission, thank god, and even with the more powerful 2.0 engine, but just not on the more luxurious trims. Though the approach is new, the end result’s the same: good, decent, respectable, normal transportation that’s hard to argue with. With that fastback shape—dare I say it looks almost Citroën-ish!—the Accord hasn’t looked this interesting since the 1970s hatchback days. Hell, maybe ever, if we’re being honest. It certainly feels like something different. Check out that arrow-shaped C-pillar! That’s fun. 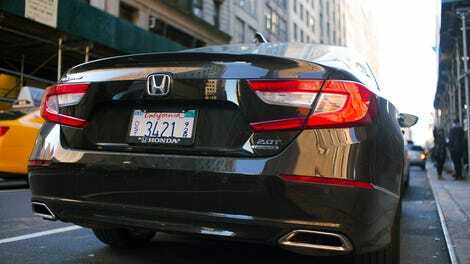 It suffers somewhat from Honda’s rigid adherence to the current corporate shield grille. But if you were ever buying Accord for looks, this might be the one time to do it. My tester even came in a nice color called Kona Coffee Metallic, and I’m always grateful when automakers offer a shade of brown that isn’t champagne or beige. Realistically, what matters most with this car is the inside, and it’s a big win there for Honda. With the new Accord we’ve finally moved past the dual screen awkwardness of the last one, and the giant sea of buttons on the car before that. It’s classy and tasteful and easy to operate—there is zero learning curve here. What I appreciated most were all the little thoughtful touches. The climate control knobs briefly light up blue when you turn them to a cooler temperature, or red for hotter. When you change the song streaming over Bluetooth, the new song’s title briefly flashes across the digital tachometer. The way you can search for addresses or points of interest like you would on Google, without having to enter the city and ZIP and house number one item at a time. Nothing about the Accord’s user interface ever feels half-assed. 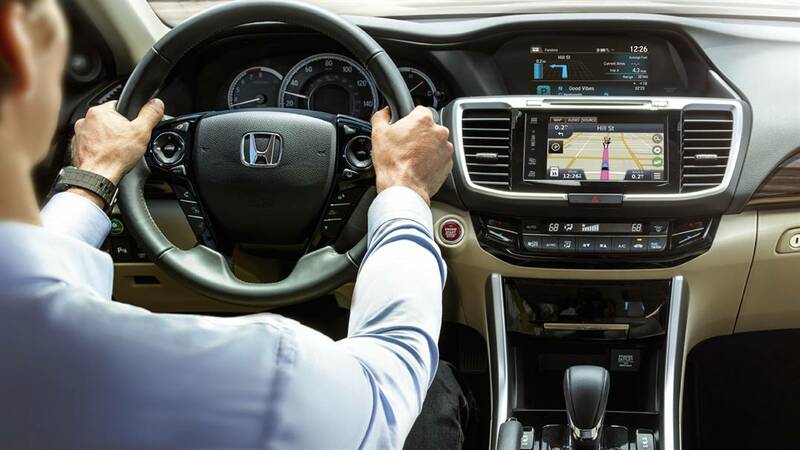 Perhaps somewhat controversially, the 2018 Touring’s 10-speed automatic transmission—lesser Accords get a manual or a CVT—dumps a physical gear selector lever for a panel of buttons, much like on the new NSX. I didn’t have a problem with it there, and I don’t here either. It’s easy to figure out and you won’t miss the stick. My only issue with this new automatic is that it seemed unusually jerky at starting speeds sometimes. When it motion, it shifted comfortably and smoothly. The only downside to all this power is the Accord has a notable degree of torque steer when you’re hard on it. I don’t mind that so much but it does make a case for an all-wheel drive version, which would probably be a decent seller. The chassis is impressive, particularly the active dampers that come standard on the Touring and make the Accord feel composed, comfortable and generally flat through corners. It handled New York City potholes as deftly as it handled quick turns and fast corners. Active dampers on an Accord! What a time to be alive. Seats, back and front, are as spacious as you’d expect and the trunk is generous. Again, it’s normal, in a way that’s straightforward and zero-drama. This tester had a Sport Mode, and paddle shifters, but if we’re being honest both are completely silly here. Quick as it is, and as good a handler as it is for a midsize front-driver, it is not a sport sedan. What it does instead is give you enough power that you can do what you need on the freeway, and corner well enough that you won’t be absolutely miserable every time you actually have to drive the car. You may even enjoy it. Another thing that impressed me: though this is a humble Accord, in this trim it has just about every piece of technology you can get on a new car these days. Just to name a few: a heads-up display, wireless mobile device charging, radar and camera-based collision warning systems, automatic emergency braking (I’m no great fan of this but it’s there), customizable digital gauges, auto high beams, steering assistance, adaptive cruise control and much more. Granted, a few times the HondaLink infotainment system wouldn’t stream or sync with my iPhone 8 properly until I restarted the car, and that was annoying. I’ve driven cars that have the same total package as all this, but cost twice as much, and certainly aren’t twice as good a car. The value proposition with the new Accord is just insane. You can have a lot without spending too much coin, especially when you consider a base 1.5 Turbo starts at just $23,570. Here, completely optioned out and loaded, this Accord Touring came out to a little over $36,675, or about two or three grand more than your “average” new car price. For all you get, it’s really not bad at all, and I’m not even sure how many Accord buyers will check every option box. The V6 manual Accord Coupe is still my favorite modern Accord, but that’s dead now, and available at used car lots if you really need it. There is no sense in mourning for inanimate objects. The 2018 Accord may be normal, but normal and boring aren’t the same thing. I never got bored with this car. It’s probably going to sell in crazy good volumes. And it’s good enough that it deserves to.